1652 ~ 1685: Born in Arima. His father is a folding fan seller. His first name is Chôshirô. He starts his actor career at an unknown date, performing in Kamigata theaters under the name of Iwai Handayû. 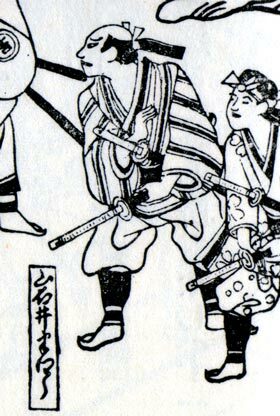 1685: Iwai Handayû takes the name of Iwai Hanshirô I. He also plays in Ôsaka in the drama "Toribeyama Shinjû". 11th lunar month of 1686: Hanshirô performs in Ôsaka, at Ôsaka Tazaemon's theater, in the productions of the zamoto Araki Yojibê I. His yearly salary is 150 ryô. His stage partners are Araki Yojibê I, Yamashita Hanzaemon I, Yamamura Kanzaburô, Sakurayama Rinnosuke I, Sodeoka Masanosuke II, Sakata Tôkurô, Takenaka Hanzaburô, Matsushima Han'ya II, Kozakura Kodayû, Takigawa Kiyosaburô, Yoshikawa Genzaburô, Mihara Jûdayû I, Wakabayashi Shiroemon and Sadoshima Denpachi. 1st lunar month of 1687: Hanshirô's rank in the first hyôbanki published in Kabuki history is naka ("middle" or "intermediate"). 1688: Hanshirô plays the role of Asakura Daigaku in the drama "Ôkumagawa Genzaemon", which is staged in Kyôto at Miyako Mandayû's theater. His stage partners are Kataoka Nizaemon I, Sakata Tôjûrô I and Kaneko Kichizaemon. Fall 1688: he plays in the same theater in the drama "Keisei Tamatebako". 1689: Hanshirô moves to Ôsaka for a higher salary (300 ryô) and plays in the drama "Ise Gosengû", which is produced by Yamatoya Jinbê II. 11th lunar month of 1689: Hanshirô becomes zamoto and produces in Ôsaka the drama "Fujiwara no Haruhime", starring Murayama Heijûrô I, Nakagawa Kinnojô and Uemura Kichiya II. 1st lunar month of 1690: Hanshirô produces in Ôsaka the dramas "Sakaba no Ôji" and "Ume no Yoshibê", starring Murayama Heijûrô I in the former and the successful duo Nakamura Kazuma II/Mihara Jûdayû I in the latter. 1691: Hanshirô produces in Ôsaka at the Kado no Shibai the drama "Sakai no Daiji Kaichô", starring Sakata Tôjûrô I. 1692: Hanshirô produces in Ôsaka the drama "Sada no Raikôji", starring Sugiyama Kanzaemon I and Otowa Jirosaburô I; this production is a failure in term of audience. 3rd lunar month of 1693: Hanshirô produces in Ôsaka Chikamatsu Monzaemon's drama "Butsumo Mayasan Kaichô", starring Sugiyama Kanzaemon I, Iwai Sagenta I and Murayama Heijûrô I; this production is a success and a long run (150 days). The same play is simultaneously staged in Kyôto at Miyako Mandayû's theater. 7th lunar month of 1694: Hanshirô produces in Ôsaka Tsuuchi Jihê I's drama "Nihon Ajase Taishi", starring the Edo actor Bandô Matatarô I. 11th ~ 12th lunar months of 1694: Hanshirô successfully produces in Ôsaka the drama "Zenkôji Kaichô". 11th lunar month of 1695: Hanshirô produces in Ôsaka a kaomise program, which welcomes the Edo actor Ichikawa Danshirô I. 12th lunar month of 1695: Akaneya Hanshichi (son of a sake merchant) and his lover Sankatsu commit suicide together in Ôsaka. This event causes quite a stir and is immediately adapted for Kabuki by Hanshirô, under the title "Akane no Iroba". The roles of Sankatsu and Hanshichi are played by Hanai Azuma and Sugiyama Kanzaemon I; Hanshirô plays the role of Minoya Heiemon. This production is a long run (150 days). 11th lunar month of 1696: Hanshirô welcomes in his Ôsaka productions the star Kataoka Nizaemon I. 1st lunar month of 1698: Hanshirô's rank in the Ôsaka hyôbanki, tachiyaku section, is jô ("superior"). 6th lunar month of 1698: Hanshirô produces in Ôsaka the drama "Semimaru Nido no Shusse", in which he plays the role of Kiyotsura; his stage partners are Asao Jûjirô (Kita no Kata), Fujikawa Buzaemon I (Mareyo), Yamashita Matashirô I (Senju Tarô), Shinozuka Jirozaemon (Sakagami no Ôji), Uemura Takenojô (Semimaru), Mihara Jûdayû I, Ogura Bun'emon and Uemura Kichisaburô. 1st lunar month of 1699: Hanshirô produces in Ôsaka Tsuuchi Jihê I's drama "Taisanji Yakushi no Kaichô". 3rd lunar month of 1699: Hanshirô produces in Ôsaka Tsuuchi Jihê I's drama "Keisei Hachijô Shima"; he falls sick before the end of the production and has to be replaced by his son Iwai Kamematsu. Hanshirô dies the following month. His tombstone is located in Ôsaka in the precinct of the Genshôji Temple, in the district of Shimoteramachi. Iwai Hanshirô I was an important zamoto and a good tachiyaku actor, who founded one of the most important lines of Kabuki actors, which started in Ôsaka and flourished in Edo from Iwai Hanshirô IV. His mon, which represents 3 folding fans, is an allusion to his father's business.